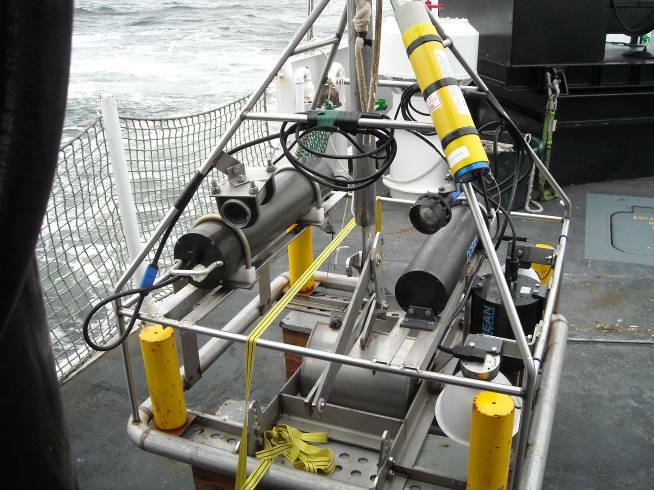 There are other data being collected besides ocean floor mapping using the Bottom sampler. 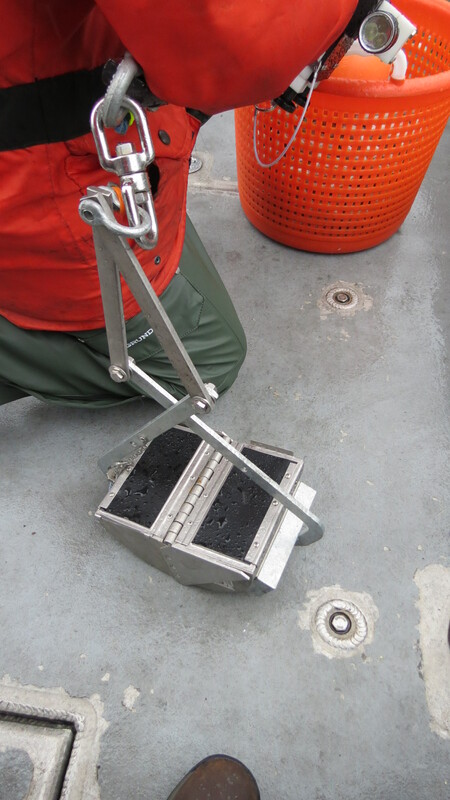 Ocean floor samples are collected at many positions along the track line. 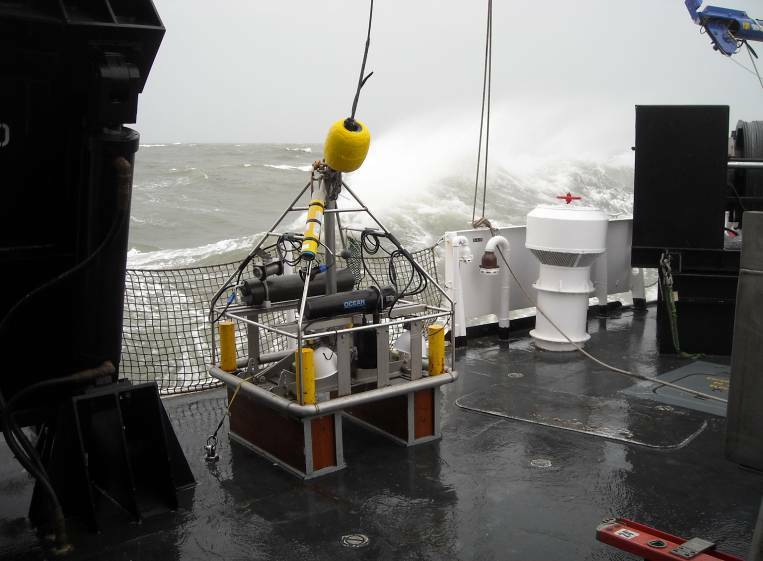 This is quite a gizmo, at the end is a metal scoop that collects soil samples once it hits the ocean floor. On both sides of the pole near my right hand, there is two underwater lights that is activated prior to deployment and a GoPro placed in a waterproof compartment. The camera is operated from a wireless connection and the remote control device is attached by Velcro to your wrist, just like a watch. The device weighs around 35 pounds. 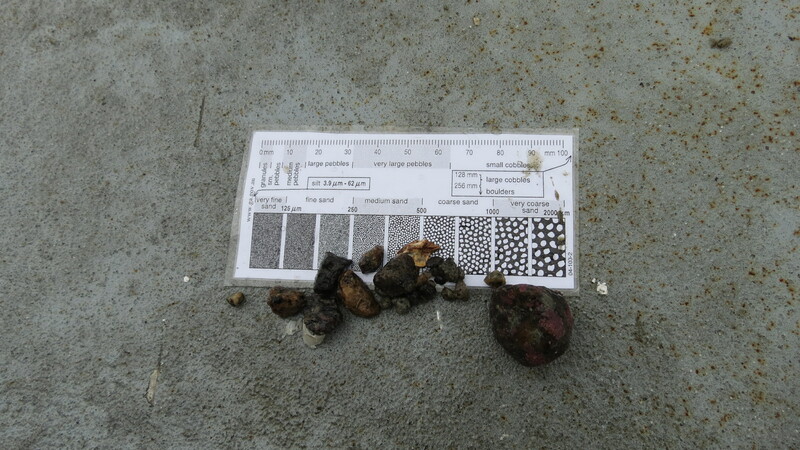 Once the sample is retracted and emptied on the deck, the size of the aggregate is measured using a scale and recorded. Why is this information useful ? 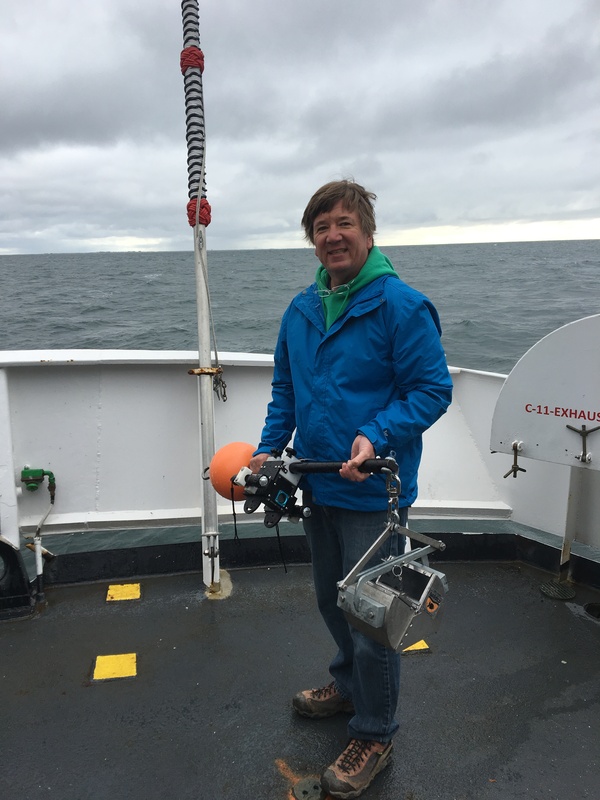 This data will be used used by mariners when assessing the best place to deploy an anchor. An ocean bottom containing a muddy composition is preferred as it helps to keep in place both the anchor and chain. 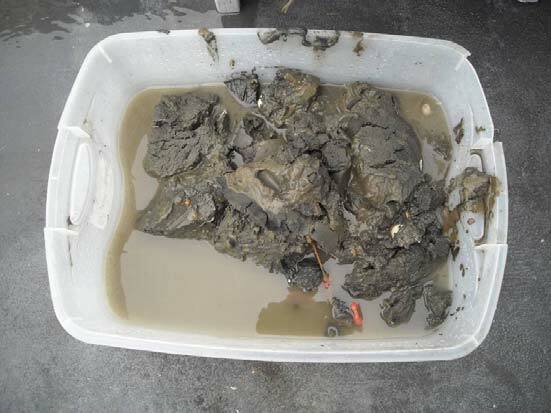 Below is a sample we retrieved off of Point Hope, Alaska. Using the bottom sample below, what are your thoughts, is this an ideal located to drop anchor? Dropping an anchor for a ship is not a 5 minute job. I recall fishing with my cousin in his small boat when I was in elementary school; we would arrive at an ideal location to catch lake bass and toss our anchor overboard. It was nothing fancy, a large plastic bucket filled with sand. With the rope attached, we lowered the bucket “anchor” tie it off with some slack and for the most part it kept us from moving. Anchoring a large 1,500 ton ship requires around 30 minutes to secure and the ocean depth would determine the amount of chain to use. The anchor weighs 3,000 lbs and 400 – 700 feet of chain is deployed; this depends on the ocean depth. This brings the total weight of anchor and chain to around 48,000 pounds. The anchor itself does not secure the ship, it is the combined weight of the chain and anchor. After the chain is deployed, officers monitor the ships movement to ensure the anchor is not dragging using ECDIS, which uses a GPS feed that tracks the ship’s movement. Interesting fact, the Fairweather can hold 100,000 gallons of fuel, for ship stability purposes the fuel supply never gets below 40,000 gallons. During the past few days, the sea has been a bit rough, but I love it especially at night, falling asleep is so much easier. It looks like Wednesday, I will be deploying the drifter buoy, stay tuned there will be an entire blog dedicated to it, including how to login and track its movement!. So far on this cruise I have not been able to view the constellations at night, the big obstacle is the fog. Remember, the sun sets at around 11:30 pm and because of our latitude, it does not get very dark at night. The other big issue has been the weather the past few days, mostly overcast and fog. As we transit to Kodiak Island, the weather forecast does not mention much about the sun, though we are in Alaska on the water! Something else interesting to note; recall a few blogs ago I discussed relative humidity as a comfort gauge? It is the dew point temperature that meteorologist use for predicting rainfall, if the dew point temperature is 75 and the air temp is 76 F near the surface rain is almost guaranteed. Cruising in the Unga Strait within the Aleutian Islands today, the cloud deck is roughly currently at 1,000 feet. It is at that location where the dew point and air temperature match and cloud formation begins. This is what we call the LCL, lifting condensation level. Last night I was talked into played the bass guitar for the first time, playing with the band on board. They brought me up to par quickly, it was fun! I left the singing to the professionals, our deck hand Kyle and the XO (Executive Officer) Mike! Until next time, happy sailing ! 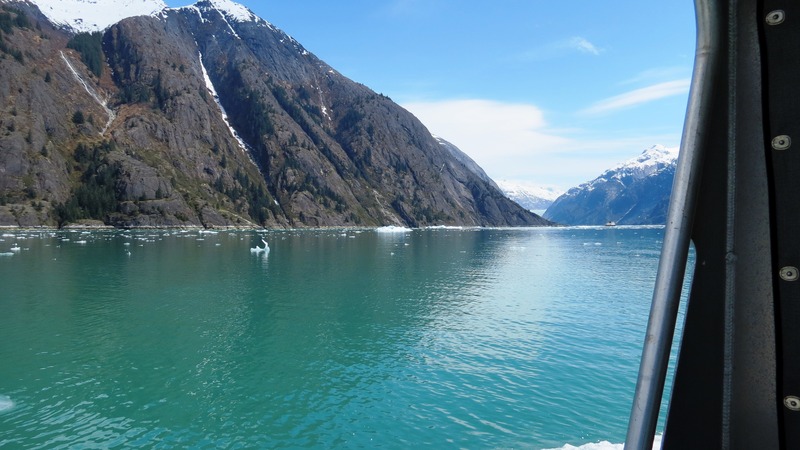 The area that NOAA Ship Fairweather is surveying is Tracy Arm and Endicott Arm. 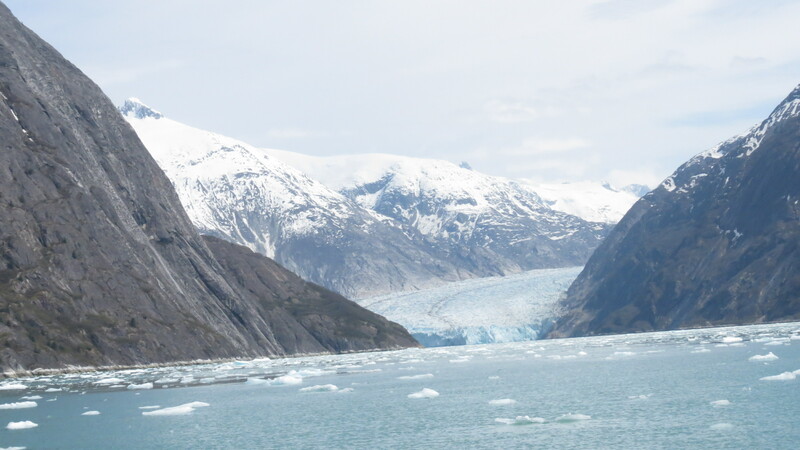 These are fjords, which are glacial valleys carved by a receding (melting) glacier. Before the surveying could begin the launches(small boats) were sent up the fjords, in pairs for safety, to see how far up the fjord they could safely travel. 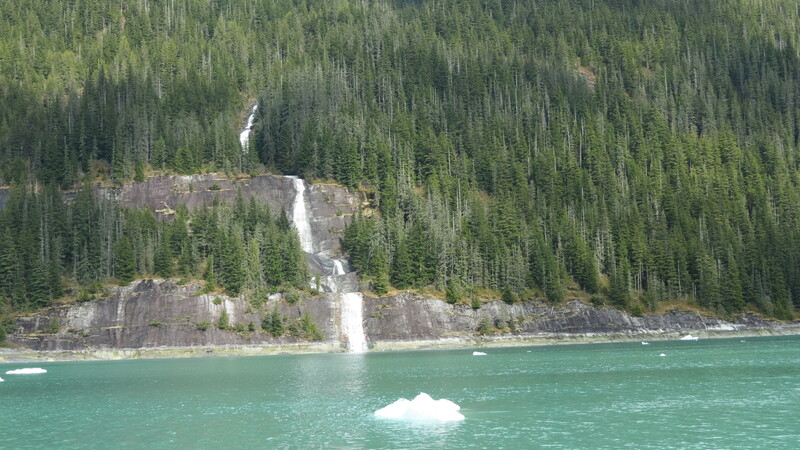 There were reports of ice closer to the glacier. Because the glacier is receding, some of the area has never been mapped. This is an area important for tourism, as it is used by cruise ships. I was assigned to go up Endicott Arm towards Dawes Glacier. Almost as soon as we turned into the arm, we saw that there was ice. As we continued farther, the ice pieces got more numerous. We were being very careful not to hit ice or get the launch into a dangerous place. The launch is very sturdy, but the equipment used to map the ocean floor is on the hull of the boat and needs to be protected. 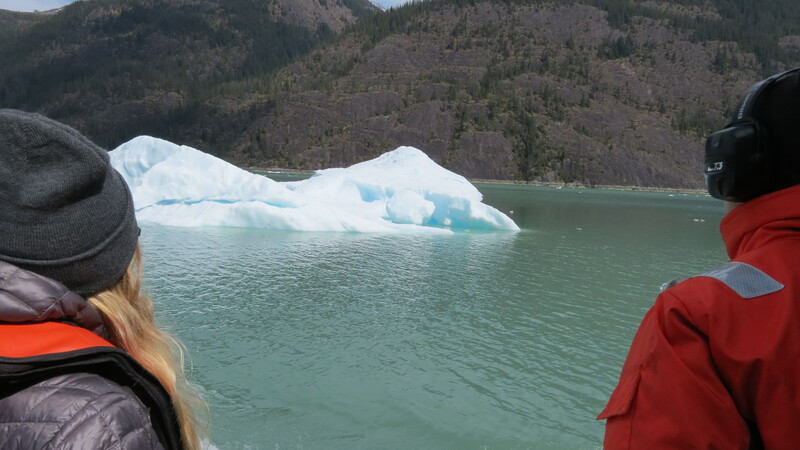 We were able to get to within about 8 kilometers of the glacier, which was very exciting. 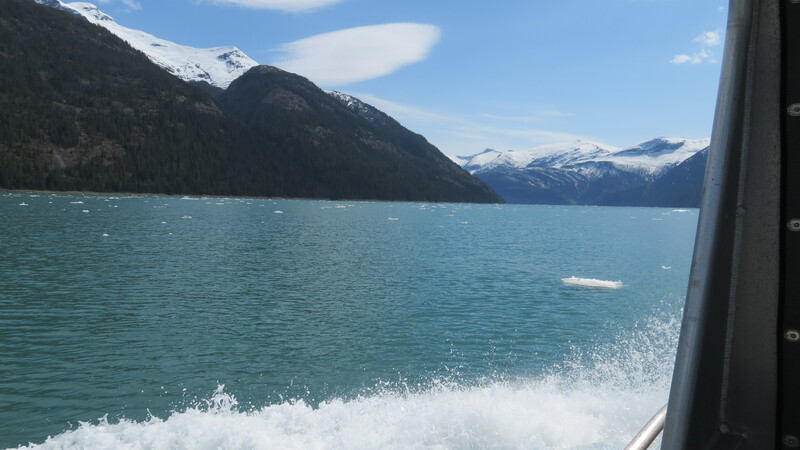 The launches have been going out every day this week to map areas in Tracy Arm. I have been out two of the days doing surveying and bottom sampling. During this time I have really enjoyed looking at the glacial ice. It looks different from ice that you might find in a glass of soda. Glacial ice is actually different. It is called firn. What happens is that snow falls and is compacted by the snow that falls on top of it. This squeezes the air out of of the snow and it becomes more compact. In addition, there is some thawing and refreezing that goes on over many seasons. This causes the ice crystals to grow. The firn ends up to be a very dense ice. Glaciers are like slow moving rivers. Like a river, they move down a slope and carve out the land underneath them. Glaciers move by interior deformation, which means the ice crystals actually change shape and cause the ice to move forward, and by basal sliding, which means the ice is sliding on a layer of water. The front of a glacier will calve or break off. 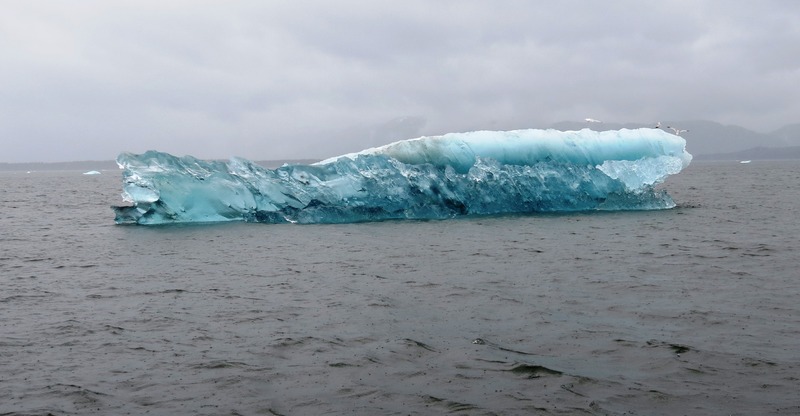 The big pieces of ice that we saw in the water was caused by calving of the glacier. What is also very interesting about this ice is that it looks blue. White light, of course, has different wavelengths. The red wavelengths are longer and are absorbed by the ice. The blue waves are shorter and are scattered. This light does not get far into the ice and is scattered back to your eyes. This is why it looks blue. 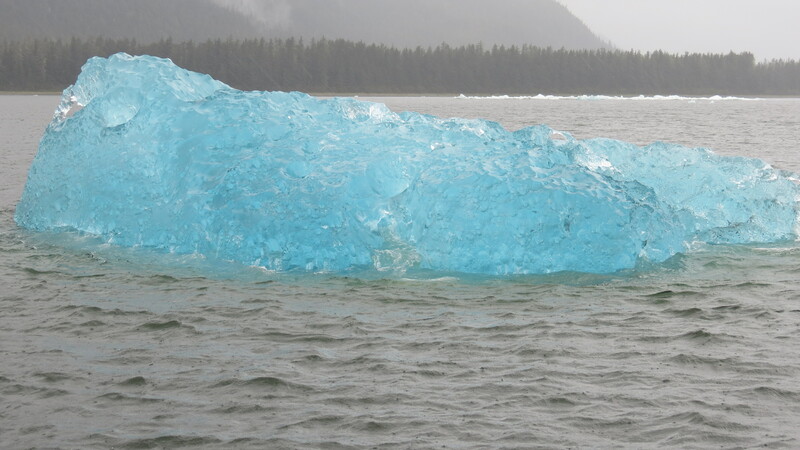 Meltwater is also a beautiful blue-green color. This is also caused by the way that light scatters off the sediment that melts out of the glacial ice. This sediment, which got ground up in the glacier is called rock flour. 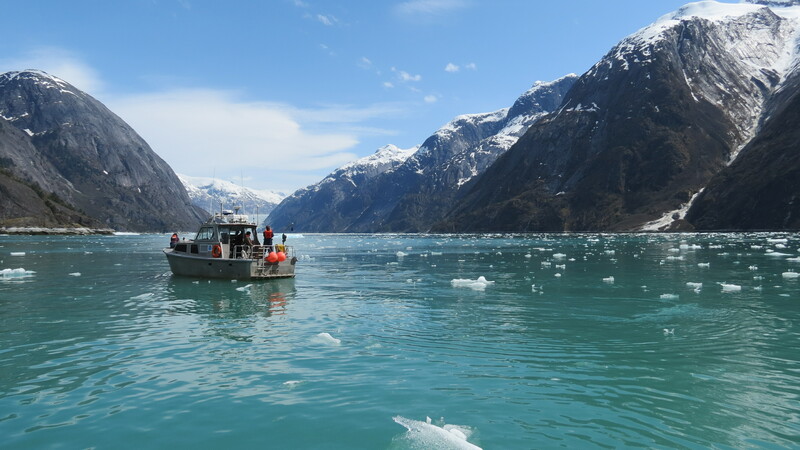 NOAA Ship Fairweather has spent the last four days mapping the area of Tracy Arm that is accessible to the launches. This means each boat going back and forth in assigned areas with the multibeam sonar running. 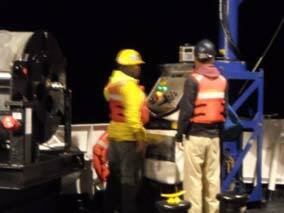 The launches also stop and take CTD (Conductivity, Temperature and Depth) casts. These are taken to increase the accuracy of the sound speed data. Today I went out on a launch to take bottom samples. This information is important to have for boats that are wanting to anchor in the area. Most of the bottom samples we found were a fine sand. Some had silt and clay in them also. All three of these sediment types are the products of the rocks that have been ground up by ice and water. The color ranged from gray-green to tan. The sediment size was small, except in one area that did not have sand, but instead had small rocks. were taken of each of the 8 bottom grabs. It was exciting to see the bottom, including some sea life such as sea stars, sea pens and we even picked up a small sea urchin. My students will remember seeing a bottom sample of Lake Huron this year. The video today looked much the same. I have seen three bears since we arrived in Holkham Bay where the ship is anchored. Two of them have been black. Today’s bear was brown. It was very fun to watch from our safe distance in the launch. I have really enjoyed watching the birds too. There are many waterfowl that I do not know. My students would certainly recognize the northern loons that we have seen quite often. I have not really talked about the three amazing meals we get each day. In the morning we are treated to fresh fruit, hot and cold cereal, yogurt, made to order eggs, potatoes, and pancakes or waffles. Last night it was prime rib and shrimp. There is always fresh vegetables for salad and a cooked vegetable too. Carrie is famous for her desserts, which are out for lunch and dinner. Lunches have homemade cookies and dinners have their own new cake type. If we are out on a launch there is a cooler filled with sandwich fixings, chips, cookies, fruit snacks, trail mix, hummus and vegetables. The cereal and milk is always available for snacks, along with fresh fruit, ice cream, peanut butter, jelly and different breads. Often there are granola bars and chips. It would be hard to ever be hungry! Kayaking, see the ship in the background? Hollings Scholar Carly LaRoche, TAS Helen Haskell, and LT Damian Manda with a bottom sample. If you have ever taken a look at a nautical map, other than just depths listed on it, there will be symbols and definitions that provide information to help with safety and knowledge of the area. For example, asterix-like symbols represent rocks, and a branch-like symbol represents kelp. Also written on the maps is information about the seafloor and what it is composed of, such as gravel, sand, or bedrock. 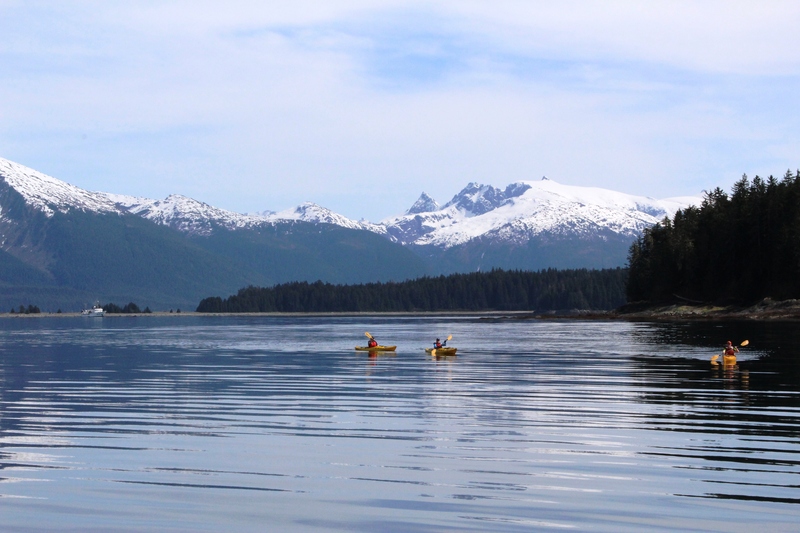 Here in southeast Alaska, off the coast of Prince of Wales Island, much of the data that is currently on the charts was collected over 100 years ago. Fairweather’s mission is to collect new information to allow these charts to be updated, and this includes information on the seafloor too. The other day I was tasked with joining a survey crew to conduct bottom sampling. The assigned bottom sample locations are provided by the Operations branch at headquarters. The sheet managers adapt the locations if they think there are better locations that will provide information for anchoring or to help characterize different regions in the area. With less than glassy water conditions on a windy and rainy day, the boats were launched and we moved to our first sample area. The technology behind sampling is a little more antiquated than other parts of the research I’ve seen. It involves hooking up a self-closing scoop like device to a rope, and lowering it in to the water until it hits the seafloor. Ideally, the trigger is released when it hits the seafloor and it closes. 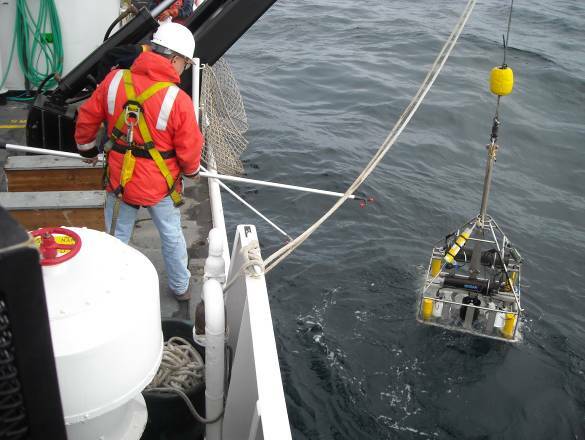 With closed scoops, the bottom sampler is winched up, ideally full of whatever material is located on the seafloor in that immediate location. There were three different styles of these bottom samplers and we quickly had a firm favorite that seemed to work the best. Easing the boat in the swell to the location, the coxswains, Dennis and Denek, would keep the boat in position so we did not tangle the rope in the motor. We could tell from the rope going slack when the bottom sampler had hit the sea floor, and a mechanical winch made the return journey easy. Dumping the contents in to a bucket we were able to see the diversity of the seafloor in just a few samples. Occasionally rocks or shells would get stuck in the mechanism and we’d have to repeat the procedure, but overall we had tremendous success. There are international protocols to follow in collecting bottom samples. These allow for communication and consistency of data on navigational charts. 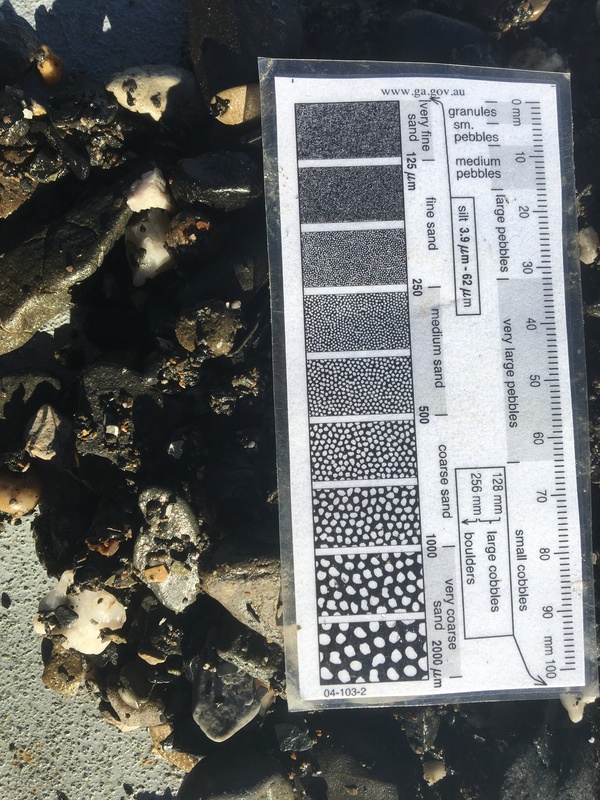 In general, the main medium of the sample is described, such as sand, mud or pebbles, and an adjective used to describe it, such as broken, sticky or soft. Color is also assigned to the sample as well as appropriate size of the grains (fine, medium or coarse). Symbols are used for all this data: For example, ‘the sample is mostly fine brown sand with mud and a little bit of broken shell’ would be written fne br S M brk Sh. Protocols indicate that if sampling is attempted three times in one location and it doesn’t work then ‘unknown’ is documented in that location. At each of the sampling locations, we marked the spot on the chart and took latitude and longitude coordinates. We also documented additional observations we had about the sample, including findings that were not included as data choices. For example, in our second sampling site we found what we thought initially were mammal hairs. Several sites later we struck ‘gold’ again, finding what appeared to be more hairs in a mud matrix. Upon reflection and discussion, it’s possible they are more likely decomposing kelp fibers. It would be interesting to have the samples analyzed to identify what these fibers/hairs come from. 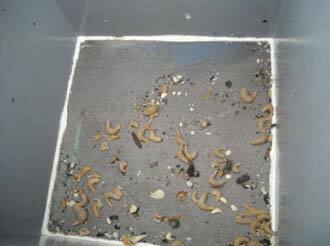 We also found whole clamshells as well as having a sample that only contained water. Our thoughts with the water only samples were that perhaps we were hitting bedrock rather than failing on obtaining any kind of sediments. 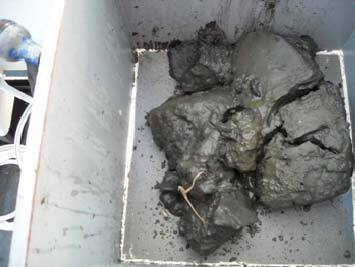 We also observed that in the more sheltered bays, the samples were very odiferous dark mud. In both of these occasions, the landscape surrounding the bay was heavily logged, and it would be interesting to see if there were correlations between the logging and the dark sediments, perhaps containing higher levels of carbon material washed in from terrestrial sources. In one of these areas, documentation from 100 years ago suggested that at that time, the seafloor was gravel. The bottom-sampling day was challenging day weather wise, both for the coxswains and the science crew, but very rewarding. 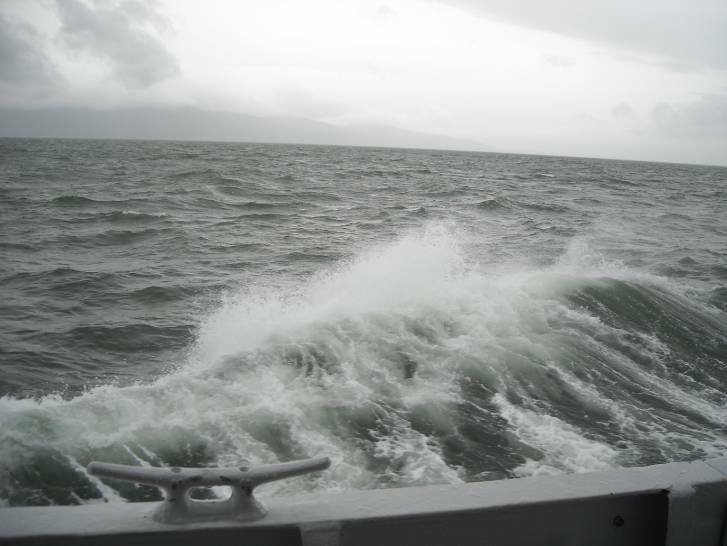 Due to the rough seas it wasn’t a good day to collect sonar data, and on days like this, other parts of the total data collection are put in to place. 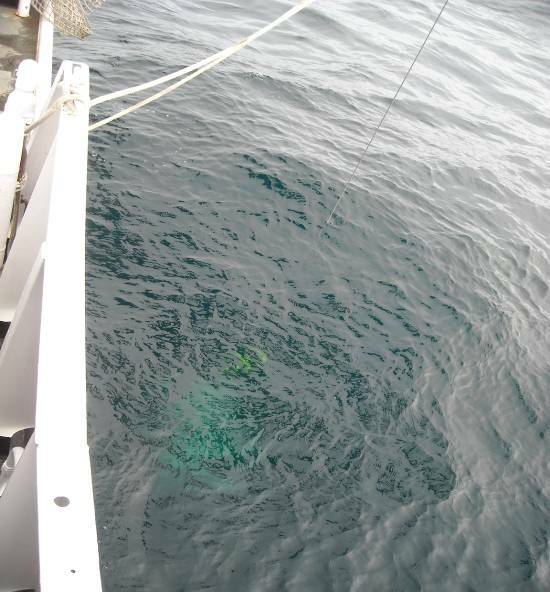 Part of our work that day was to also do crosslines (sonar data verification) but the water conditions were too hazardous in certain directions of travel, and so it was decided that we should focus on bottom samples. To be frank, this was my favorite day as a Teacher At Sea so far. Truth be told, I was reminded that I quite enjoy sticking my hand in a bucket of mystery ‘goop’ and trying to figure out what it is composed of. The diversity of samples was completely surprising and finding hair samples, twice, completely intriguing. It was great also to observe upcoming OPS officer, LT Damian Manda at work logging the data, and realize again, the role technological knowledge plays a role in the success of this research. And, thank you to Coxswain Dennis Brooks for taking most of the photos for this blog entry. Backscatter is the intensity of acoustic energy received by the sonar after interacting with the seafloor. Backscatter data can be used to help determine the surface of the seafloor. In softer areas, perhaps a surface of mud, returns a weaker signal, but a harder surface, such as bedrock returns a stronger signal. Hollings scholar Carly LaRoche from American University is on the boat for several legs this summer and is collecting and analyzing backscatter data in the area. Bottom sampling of the area is allowing Carly to compare the backscatter data with the sediments collected to see if there are correlations. For about half an hour after the photo above, I just sat on E-Deck and watched the sun set. As I write this and look at the picture, I’m sadly realizing that this incredible month is rapidly drawing to a close. While I miss my sons and dog, this has been one of the most rewarding experiences of my life and I wish it could continue. While we were anchored up behind Hagemeister Island near Hagemeister Strait, I learned this island is named after Captain Leonty Andrianovich Gagemeister, a Russian Naval Commander in the early 1800’s. The island is undeveloped and has no permanent residents. It would have been fantastic to take a launch over to it, but there was a lot of work to be done on board the Fairweather. At 1400 hrs on the 4th, Dr. McConnaughey gave a one-hour briefing on the FISHPAC and EFH work his team has been working on. The briefing was voluntary, but as you can see, almost everyone on board was there. 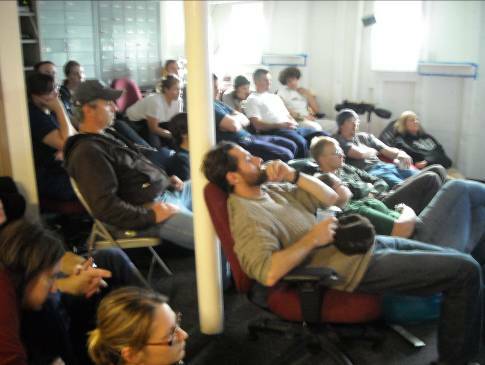 The crew listens to Dr. McConnaughey’s presentation about the FISHPAC research. Actually, Dr. McConnaughey could have finished in an hour, but the crew had so many questions – really good questions – that the ensuing discussions lasted another hour. Even afterwards, conversations at dinner were reflective of the seminar. Once again, the collegial atmosphere on board the Fairweather was evident. It was great to listen to and watch the physical scientists going back and forth with the biology folks in interpreting each others’ results and parameters. At 1000 hours on the 5th, we weighed anchor and got under way. It took a few hours to get back to where we had ceased survey and sampling operations two days earlier and we picked right up where we left off. The weather was quite nice and we got the remaining samples done in just a couple of hours. When we had finished that part of the work, there was enough time left on the mission to resurvey some anomalies that had been observed several years ago. The Fairweather had documented several “mud volcanoes” or “mud plumes” in Bristol Bay and the CO wanted to verify their presence. In order to do so, Launch 1018 was deployed for several hours to try to find the anomalies with the Multi-Beam sounder on board, knowing, however, that bottom structures like this are sometimes transient in nature. They were looking for a 3 meter high “cone-shaped” mound, but instead found a depression about two meters deep. Perhaps the previous party had misinterpreted the side-scan data. This is the type of ambiguity that calls for continued surveying, research and the development of new technologies. This leg has been a real busy one for Electronics Technician Mike Hilton. 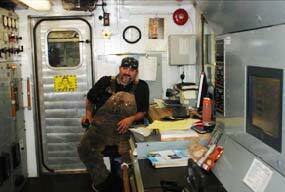 When we first arrived in Dutch prior to the leg, he had to go up into the satellite dome and reconfigure some of the internal settings in order to get internet and satellite access for the ship. We had actually lost that capacity during the rough night on the last day of the Shumagin leg. When we first lost internet (all the computers aboard are connected to a LAN) and folks were a little impatient, there was an announcement on board something like this, “Attention on the Fairweather, for those of you suffering acute internet withdrawal symptoms, the ET recommends you lay to the lounge and take out a couple of books and read them!” Without Mike, the ship would be severely handicapped. 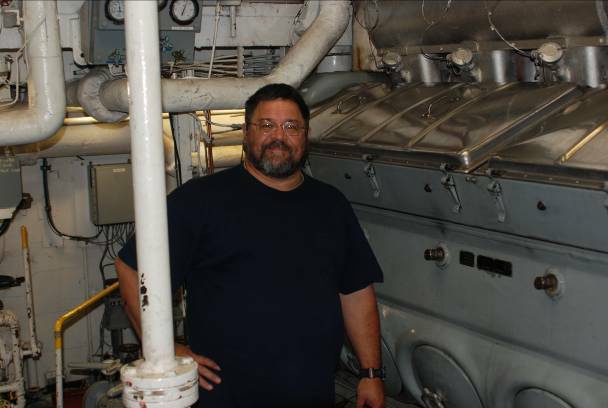 During my time on the Fairweather, I was privileged to be given an under way tour of the engine room by Andy Medina (you remember Andy – with that big halibut!) Fairweather’s main propulsion plant is a pair of General Motors Electro Motive Division 12-567 CLR engines. I realize this sounds long winded, but what the model designation indicates is that the engine (remember, we have 2 mains– port and starboard) has 12 cylinders each of which is 567 cubic inches in size. In comparison, a 2009 Mustang has an option for a 282 cubic inch V-8. That means that EACH of Fairweather’s cylinders is about double the size of the whole engine in a new Mustang! Further translation – Fairweather’s main engines have the equivalent of 48 Mustangs of engines!!! They are HUGE! By the way, the Electro Motive Division is the division of GM that makes engines for Locomotives! Fairweather also has two generators, each putting out 330 kilowatts of electricity and an additional diesel engine just for the bow thruster. Also, four more small diesels on the launches and a few outboards for the skiff and we have a pretty complex engineering need. Not only do they keep the engines running, but they are responsible for heating and cooling, waste water and sewage treatment (there’s a treatment system on board) and making fresh water. To keep all this running smoothly – as our mission is dependent on them all running flawlessly – two engineers stand each watch in a “4 and 8” rotation meaning they work for 4 hours and are off for 8 and we sail with a minimum of 8 members in the engineering department. (This is the standard watch schedule for officers and survey techs also.) There needs to be a member of the engineering department in the control room at all times while we are under way. When I arrived in the control room for Andy to give me my tour, we could not leave because the other engineer on watch was on a short break and he was not permitted to leave the control room. After we chatted for 3 or 4 minutes, Mitchell came down and we went through the engine department. It took about half an hour and my eyes glazed over after only the first few minutes! There is SO MUCH stuff going on in there that it’s amazing the guys can keep track of it all. I may be smiling on the outside . . . I was wondering when . . . It’s now!!! 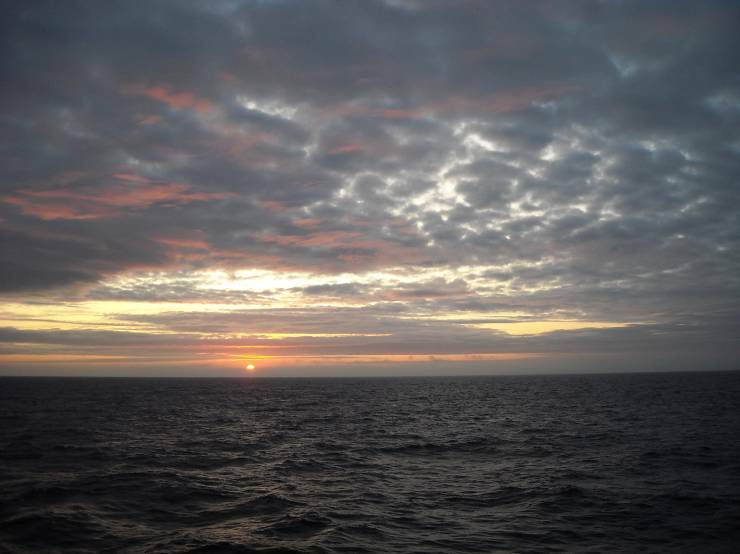 One of the aspects of hydrographic surveying and research out of sight of land for extended periods of time is that the days and nights blur into an uninterrupted continuum. At breakfast today, LT Andrews said, “It’s Tuesday.” I said, “Is it?” and he responded that “It’s always Tuesday at sea.” I asked “Why not Wednesday, at least then it’s ‘hump day’ to the weekend?” He answered that sometimes it seems you’re never closer to anything. It was a fun exchange, but as the FISHPAC leg continues, I am realizing that the idea is spot-on accurate. 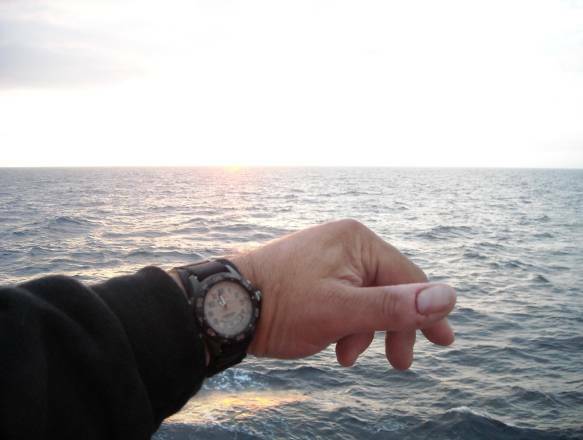 Coupling the “sameness” of the days, with the fact that the ship is on 24-hour operations, it’s easy to get confused! SeaBoss on the deck. In the background, the wave tops are being blown off the waves! We’re using SeaBoss to grab samples every three to five hours and I’m learning about some of the relationships between bottoms and infauna. Significant, however, is the fact that almost regardless of sea state, SeaBoss gets deployed. I say “almost” for a reason. 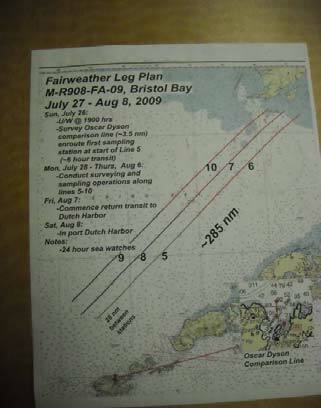 Legs 9 and 10 of the FISHPAC survey (as shown on a previous log) are in a North Easterly direction. Two days ago we received a weather update anticipating a strong low pressure system approaching. As we went through the day of the 3rd, the barometer was falling rapidly, the wind ramped up continuously and seas grew to 10-15 feet. By early afternoon it became impossible to deploy SeaBoss safely and the CO ordered us to suspend operations and head for Hagemeister Island in order to anchor behind it. Notice to the right of the SeaBoss – that’s a wave breaking onto the fantail! We arrived there at 2000 hours (8 pm) and anchored. I took about a 10 minute video of the waves and the ship getting tossed around. I’ll try to post it when I get home next week. In the early 1800’s, Sir Francis Beaufort devised a scale to estimate wind speed based on the appearance of the ocean’s surface. It is a scale from 1-12 that correlates the appearance of the ocean surface with wind speed. It is called, appropriately enough, the Beaufort Scale and we experienced a solid 7 on the scale. Exhausting but exhilarating! Anyone who takes the majesty and power of the sea for granted should undergo a thorough psychological exam! The officers on the Fairweather are commissioned mariners. In order to join the NOAA Corps of officers, one needs to be less than 42 years old and a college graduate. It is preferred that the undergraduate major be in the physical sciences, math, engineering or computer science. These are exceptionally qualified uniformed servicemen and women of the United States. 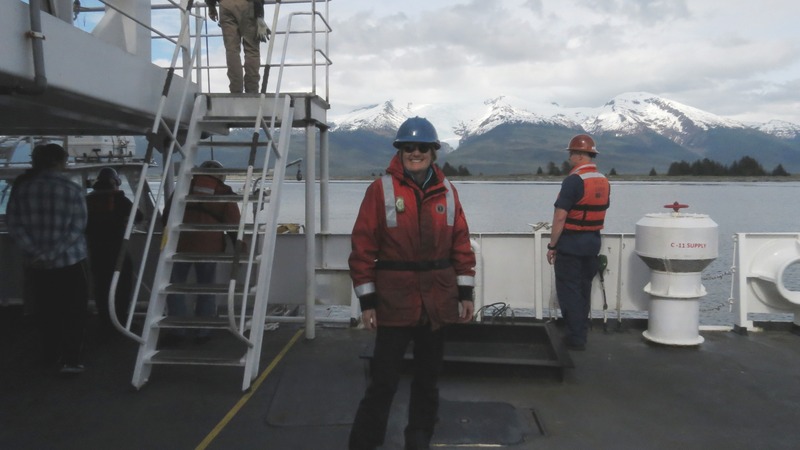 A career with NOAA as an officer is rewarding and in service to the nation. It is a career I will certainly discuss with my future students. Just about everybody has heard of Latitude and Longitude, but what do they mean and how are they measured? This is the bottom sample after it has come straight from the water and into the collection bin. We have made about 30 stops along the tracklines for bottom samples as described in a prior log. When the SeaBoss comes to the surface, the scientists check to see if it grabbed an adequate sample. Sometimes it will strike the bottom at a bad angle, land on a rock, release prematurely or catch a big piece between the halves of the grabber and lose the sample on the way up. But on the 90% of deployments that are successful, the sample is emptied into a large bin and taken to the sifting table. It is washed with salt water and the critters within the sample are collected. The bottom sample has been moved from the collection bin into a sifter box. It looks pretty gross when you pull it up and the scientists estimate how full the sampler was, how deep it went into the bottom and describe the color and texture of the sediment. All of these criteria go into the evaluation of the bottom. This is the sample in the sifter box. The screen at the bottom has a 1 millimeter mesh which allows anything less than 1 mm to be washed through and overboard. It can take anywhere from 2-6 minutes to screen out the sample depending on the sediment grain size. After it has been sifted out, the bottom sample reveals all the things it was hiding. This is a screened sample from a relatively shallow grab (probably <150 feet.) 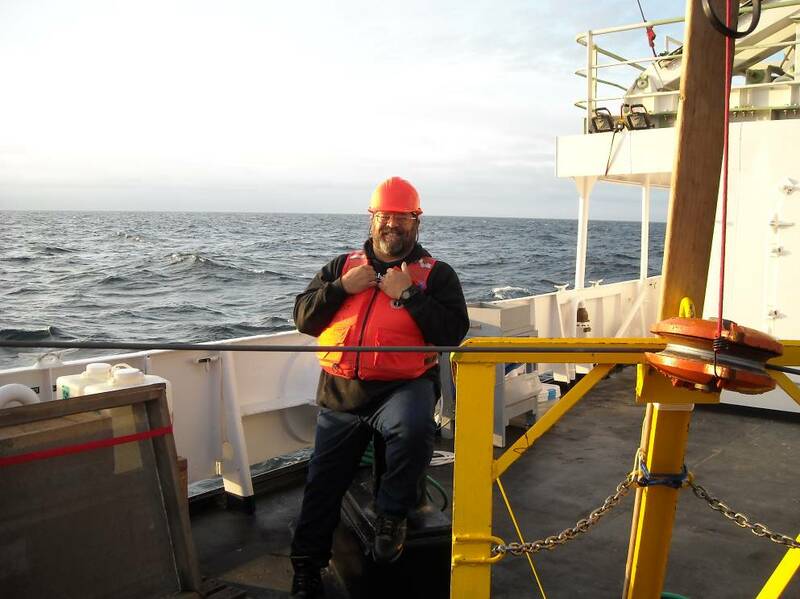 One of the interesting things that Dr. McConnaughey and his team have determined is that the wave energy in the Bering Sea in the winter extends down to almost 250 feet! This wave action carries away the finer sediments which leaves a coarser bottom. The coarse bottom has interstitial spaces that allow for animals to burrow and survive. The “cashew-looking” critters are members of the Phylum Echinodermata, Class Holothuroidea (Sea Cucumbers). They represented a significant portion of several of our samples. By establishing this correlation between sediment and animals present, and integrating that with gut analyses done on other ships catching target species at other times and cross-referencing that information with hydrographic survey information, it may be possible in the future to be able to predict what species will inhabit what areas. This type of data is absolutely essential to maintain a sustainable yield in the fishery and avoid depletion of the resource. It is environmental stewardship at the highest level. I’ve been very fortunate in my life that this is my third time out to sea for more than just a day or so. The first time was almost 30 years ago in grad school in California (about 2 weeks), the second time in January of 1991 going from SC to the US Virgin Islands (a week) and not these legs with the Fairweather. One of the things I had forgotten was how dark it gets at sea at night. Even though dawn this leg is about 0615 and sunset is around 2300, we have been conducting 24-hour ops for most of the time. So we’ll be deploying the SeaBoss at all hours. I took one of these pictures with a flash and then turned the flash off and took the second. No explanation necessary. IT’S REAL DARK! SCARY DARK! 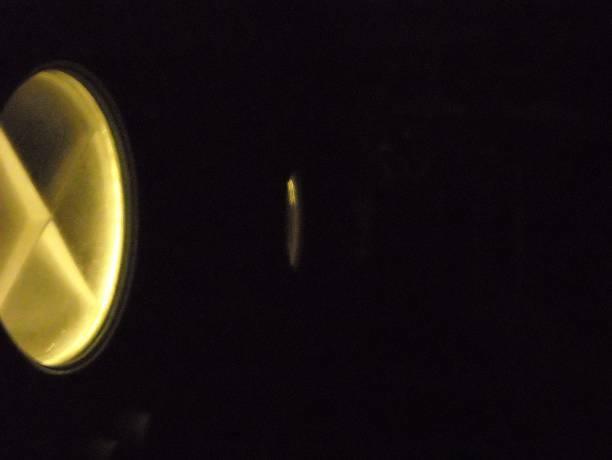 As you can see, there’s plenty of light on the fantail to work, but outside our little orb of light, it’s real dark! Renoud and Argento deploying the MVP fish. By the way, 10ºC is a warm day here! This line is laid out in a figure 8. 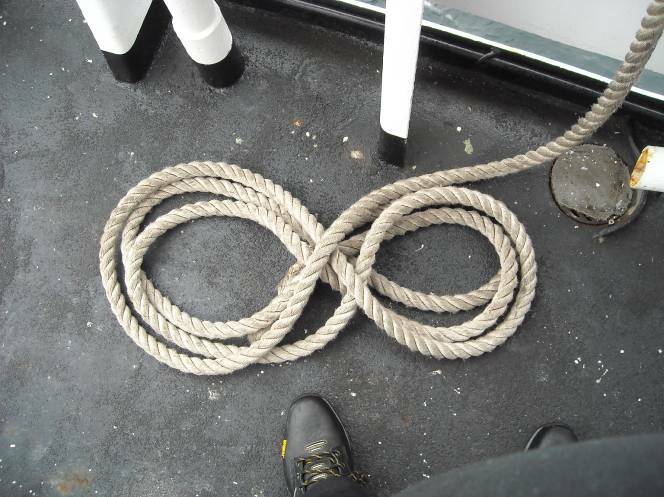 Why would this be a good way to have a line arranged if it has to be paid out gradually rather than in a coil? The next couple days should be interesting. CO says we have some weather coming! The Magnusen-Stevens Fisheries Conservation Management Act includes the broad designation of “Essential Fish Habitat” (EFH) as including myriad parameters which are to be considered for all life stages of the managed species. Included in them are bottom type, epifauna and infauna, grain size, and organic debris. Additionally, studies are to span the life cycles of those species. There is an enormous amount of historical data relating to commercial fisheries catches, but the data have not been assembled as a whole and screened for accuracy. Additionally, there has been virtually no search for correlations within the data. 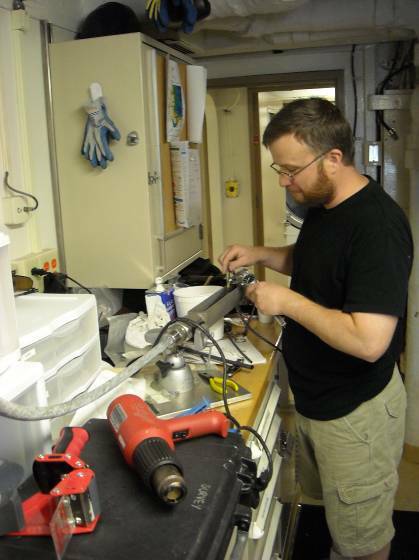 Dr. Bob McConnaughey is engaged in seeking correlations between bottom characteristics, managed species and sorting through extant records in the search for utilizing sonar data to anticipate species presence in the Bering Sea. The phrase I’ve heard is “using bottom characteristics as proxy for prey identification.” Earlier cruise results can be viewed here. It would take a long time to describe all that they do at the Alaska Fisheries Service Center, so what I highly recommend is that you spend a while at their site. In addition to searching for correlations between trawl catch data and bottom characteristics, Dr. McConnaughey and his team are trying to determine if sound data (Multi-beam Echo Sounders and Side Scan Sonar) can be used in anticipating what species will likely be present in a given area. There are 69 managed commercial species in Alaska alone, which represent an enormous proportion of the commercial US catch, and if technology and research can be gained here, it can conceivably be applied elsewhere. The Alaskan fisheries have also not been subjected to as much commercial fishing as, say, the coast of New England due to the remote, harsh and generally newly populated area which is Alaska. Commercial fishing here is, for the most part, less than 50 years old compared to the hundreds of years off the East Coast. SeaBoss being deployed. It is suspended from the J-Frame and swung outboard. Tending the SeaBoss can be hazardous so crew members are tethered to the deck. 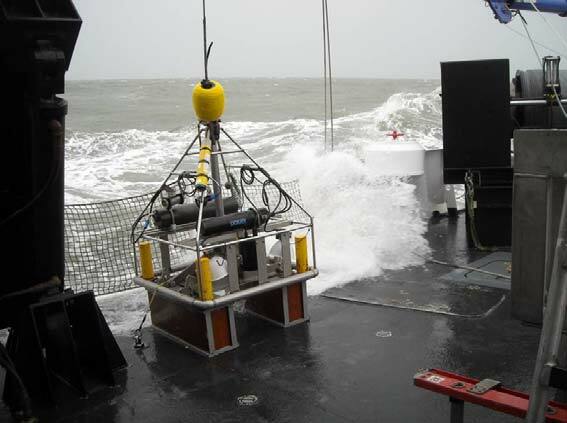 SeaBoss allows the team to gather a 0.1m2 bottom sample, descending and forward looking video and still pictures taken just before it hits the bottom. SeaBoss gets deployed twice at each site. The first sample is brought up and dumped into a sieve with a 1mm grid size. It is then gently hosed off with seawater to clear away the inorganic materials and large particles. The remaining biomass is put into containers with formalin solution for 2 days and then put into an alcohol solution to prevent decay. Those samples will be quantified back in the lab in the Seattle area. With the second sample from roughly the same bottom area, samples are taken of the bottom material itself from the surface and from a couple of centimeters below the surface. These, too, will be quantitatively evaluated back in the lab for grain sizes present and the proportions of those grain sizes in the sample. For background information on the SeaBoss, go here. Jim Bush in the bosun’s chair. Rick Ferguson (l) and Chief Bosun Ron Walker assisting. 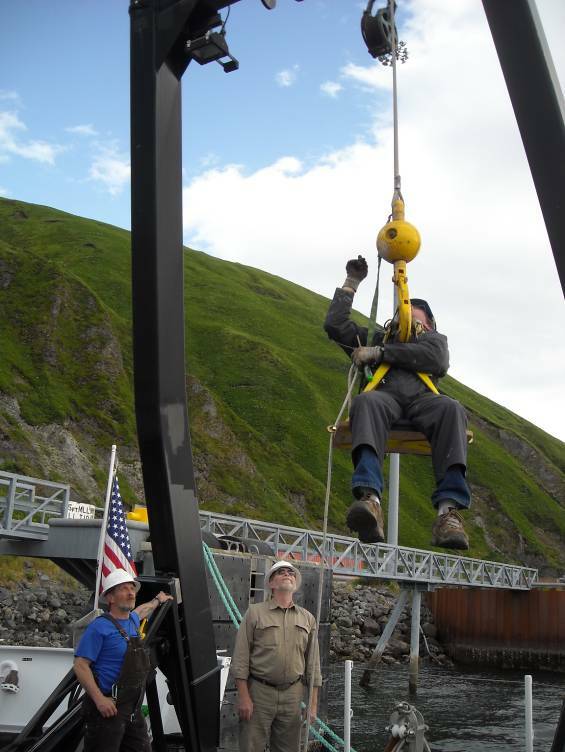 Before we left Dutch Harbor, we took on fuel (about ¼ of a load – only 22,000 gallons!) We took on ship’s stores (food.) 100+ gallons milk, 25 cases produce, a couple hundred pounds of meat (beef, chicken, pork, lamb,) scores of loaves of bread, and numerous cases of ice cream as well as other things. It took several hours to stow it all away. We also took on about 10 pallets of scientific gear for the FISHPAC team. One of the more interesting scenes was watching AB Jim Bush rigging the A-Frame for deploying some of the equipment off of the fantail. Check out the web sites I listed, there’s some really cool stuff on them.